JeTi and the first snow have a very sweet story together. When Tiffany first came to Korea, she had no family members here, as the winter approached, she expect herself to witness the first snow alone. But she was wrong. For the first three years Tiffany came to Korea, she watched the first snow with Jessica. It is unknown to us about the story of their first snow for the first two years, but for the third year, their meeting is just so magical. As Tiffany told us through a radio show, when the first snow fell, Jessica was there by coincidence. Fate brought them together again. Here’s the actual radio interview with translation by bug. Here’s a comic version of the story, made by fans. 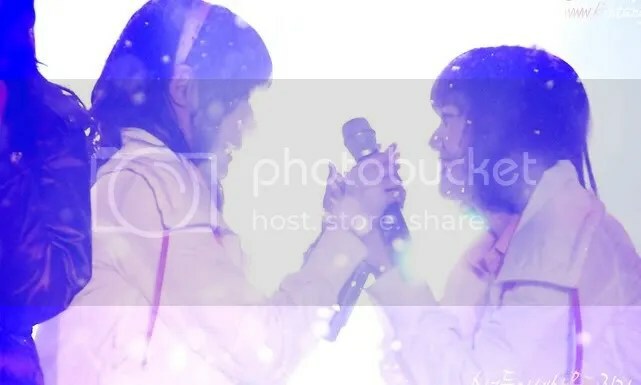 The term JeTidal Wave came from the brainchild of one of the senior JeTi shipper, Tsuna (Katie). 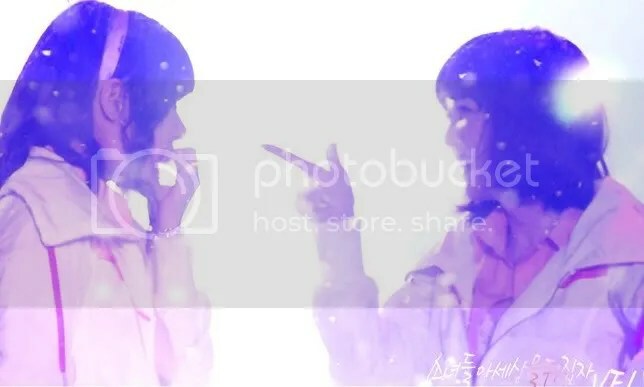 She came out with the word during the first time the JeTi thread reached 100th page back in April, 2009. The term since then has been used to describe the thread. The word ‘Surfer’ was my idea. Since we’re celebrating the JeTidal wave, why not surf it?, I thought. After further discussions we decided to be called, JeTidal Wave Surfers. – visionaries, we have quite an imagination. – detectives, no JeTi moment can escape our eyes. – love Soshi Bond more than anything. Even more than JeTi. Mr. and Mrs. Hwang – lol..Lauren came up with it, I love it. 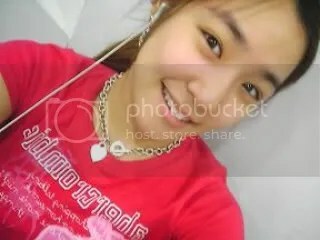 PrinceFany – when Fany act all princely..
Join us anytime and be a Surfer. We always welcome new surfers on the Island. Surf’s up! This is a story of two girls named Jessica and Tiffany. Jessica is a quiet girl who’s training in SM Academy. She enjoy being there preparing herself to become a star. She’s considered the senior among other trainees. Every year, there will be new trainees joining their academy. Being the senior, she often play pranks on the new trainees. One of the incidents was when she teamed up with her friend Hyoyeon to bully a new girl, Yuri. 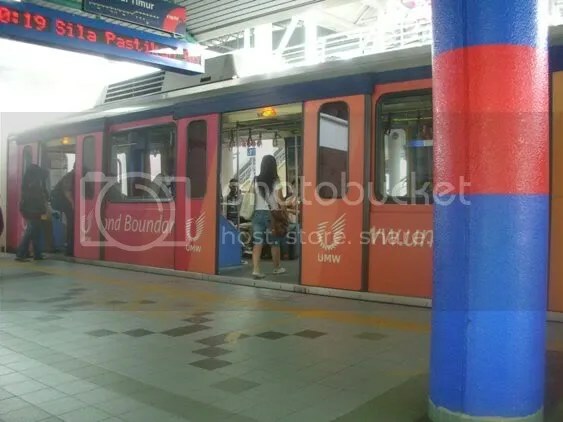 In her 4th year training, the new batch of trainees came as usual. She didn’t even bother to get to know them, because it’s all irrelevant to her. 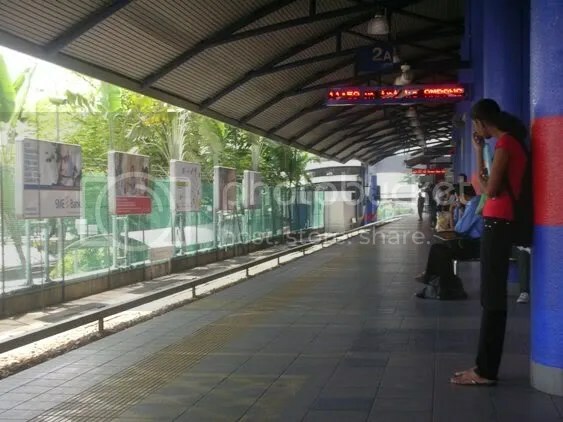 One day, she was busy chatting with all her other friends when suddenly a girl with blonde hair approached to her. “American girl! !” shriek the blonde girl with a high pitched voice. Jessica was really surprised; no one ever talked to her like that. Especially strangers. 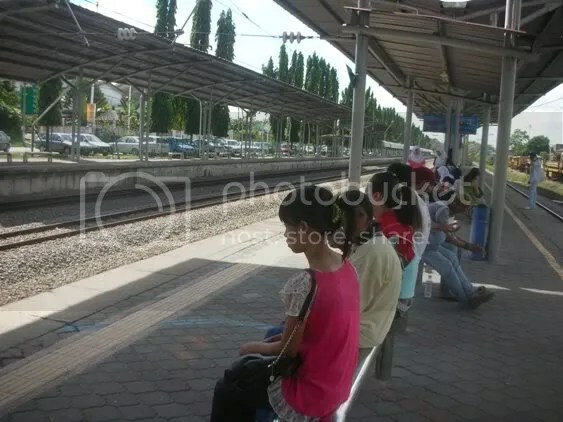 She gave the girl a weird look, thinking the girl will just move on to bother another person. But man, how wrong she was. She knew at that moment that life will not going to be the same for her. And she was right. 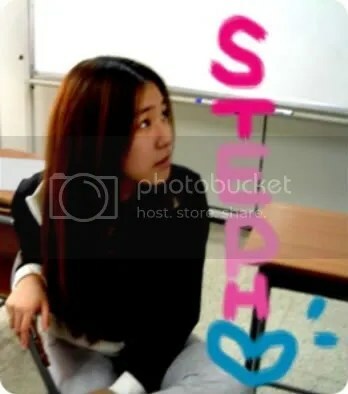 The high energy girl, her name is Stephanie a.k.a Tiffany by the way, is going to the same school as her. And the same class too. History. Now history classes will never be boring. Tiffany is different from any other trainees. Other new trainees will think twice to be that friendly to Jessica (the senior) in the first meeting. But Tiffany is not like other trainees. Jessica didn’t even understand why she even complies with Tiffany’s wishes. Tiffany couldn’t eat Korean food because it’s unfamiliar to her, and she beg (who else..) Jessica to fed her some American food. Jessica took the girl to western restaurants so that she can get her American food. Sometimes she chuckled at the fact how different the both of them are yet they can be friends. 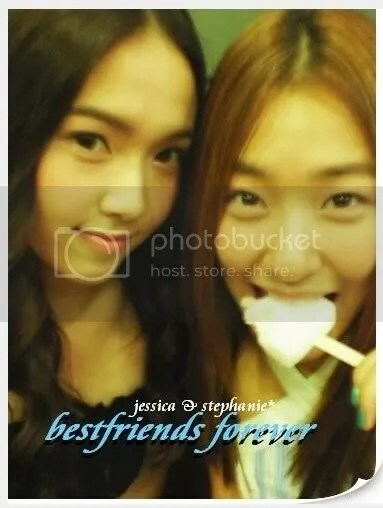 Time passes by, and Jessica realized that it’s not that bad being friends with Tiffany. She actually enjoyed it very much. They hang out with each other a lot, and they always took pictures together. Jessica love selca. Tiffany too. Oh, there’s something in common between them. The camera just snaps away whenever they’re together, whether in class, practice room or restaurant, they want to be pictured together. Jessica smiled as she noticed her phone memory is almost full with her pictures taken with Tiffany. Yoona is another trainee that is beautiful like a flower. You have some serious mental problem if you don’t think Yoona is beautiful. 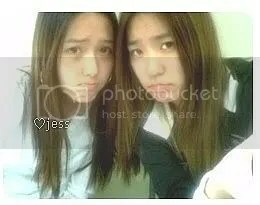 Jessica and Yoona entered the academy at the same year, so they’re really close. But Tiffany? Didn’t she just met her at the time? Jessica couldn’t even answer the question. Am I really a good singer? But starting from that point she begin to fall deeper into singing. Yeah, this is it. 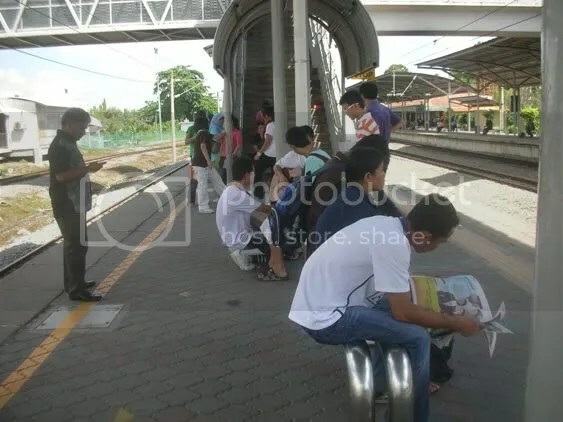 Their daily routine? After school ends, at about 3pm, they will go for lunch and then head for practice. It was really hard juggling school and practice, but Jessica is grateful to have Tiffany. Whenever she has problems to complete her homework, she will call up Tiffany. Sometimes they will spend the whole night just talking and falling asleep by the phone. 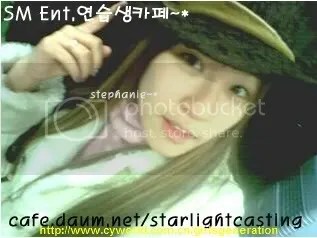 Tiffany lives in the company’s dorm with other trainees, like the Chinese girl, Li Yin, the actress trainee Ara and the girl with thick accent Taeyeon. Taeyeon is Tiffany’s roommate. She’s a really nice friend. Sometimes she will bring Tiffany to her hometown for the holidays, since Tiffany has no relatives in Korea. Other than Taeyeon, Tiffany also became close with one of their senior, Isak. Jessica, Tiffany and Isak always hang out together. Isak, being the unnie saw the girls grew up before her eyes. Jessica and Tiffany always tease each other, in the friendly way. They enjoy fighting with each other. One of the unforgettable incident for them was the misunderstanding over the word ‘Jungsook-ee’. Jessica saw the sign that says ‘Jungsook-ee’ and became curious what it meant. She’s pretty sure it’s someone’s name. “My name is Jung Sooyeon, so ‘Jungsook-ee’ must be a person”, she thought. 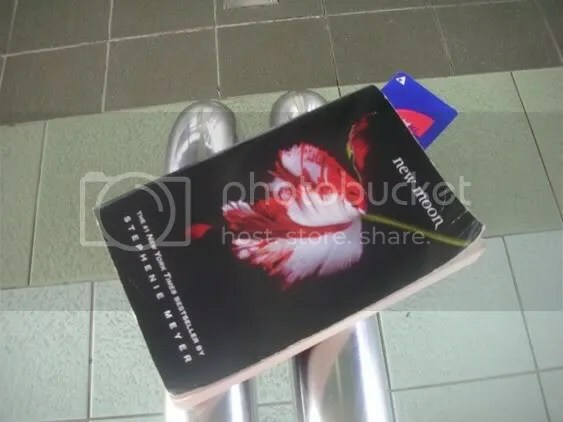 She asked out loud, “Who is Jung Sook Ee?”. Tiffany heard her and made the ridiculous look on her face. “This is my chance to pick on Jessica, she didn’t even know what ‘Jungsook-ee’ means? And she make fun of my Korean?”, Tiffany thought. Jessica was surprised, but she knew Tiffany is going to brag. It turns out that neither of them was correct. It was a sign that says, “Be silent.”. .. They became the laughing stock at the academy for some time, courtesy of a trainee, Sooyoung. Time passed by rather quickly. And then came winter. 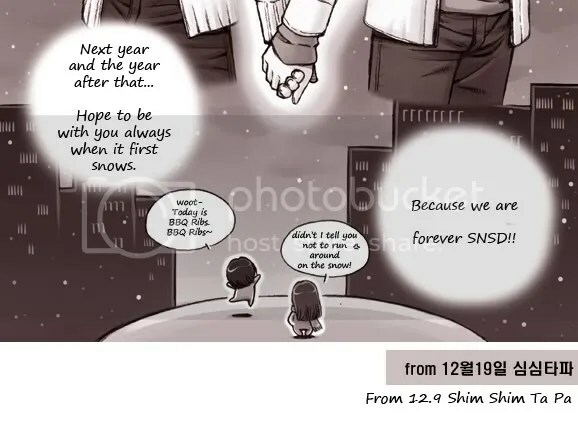 In the first year Tiffany was there in SM, she thought she’s going to witness the first snow of the season alone. “Ah, it’s the first snow..”. Tiffany was surprised and turned to look at the direction of the voice. She saw Jessica, standing in the middle of the snowfall. She can’t help but think how beautiful that sight was. The second year, Tiffany was walking with Jessica when suddenly a cold white flake falls on her shoulder. Jessica chuckled at the sight of hyper Tiffany waving her hand around to catch the snow. 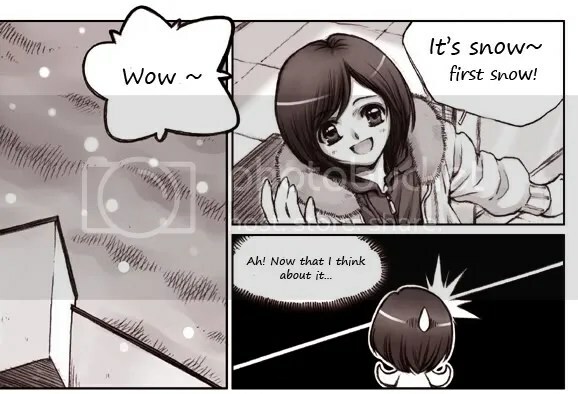 She then realized that it’s the second time they watched the first snow together. She smiled. Tiffany is a people person. Nobody can hate her once they met her. Jessica is a living proof. 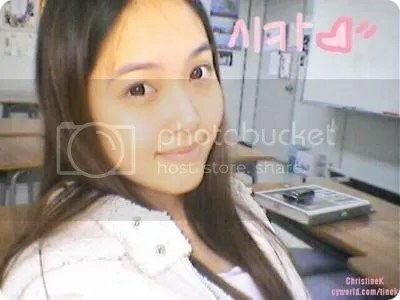 Jessica’s little and only sister, Krystal is no exception. 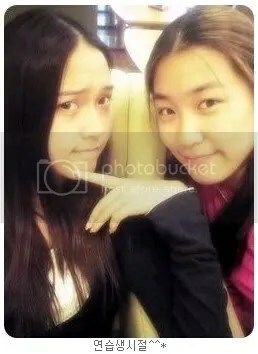 Tiffany and Krystal gets along really well, they ended up being shopping buddies. The three of them went shopping together, and speaking English is a bonus for them. To tell the truth, both Jessica and Tiffany (and probably Krystal) still feel more comfortable speaking English. The day they were told they’re going to be in a group was unforgettable. Jessica was really happy. First, she didn’t have to wait for who knew how many goddamn years to finally debut. And second, she’ll be in a group with Tiffany. Yoona is a bonus. Jessica knew how hard Tiffany worked to get herself noticed. She study her Korean, she stay back to memorized all the songs.. She even started to lose weight. The group will be called Girls’ Generation. Jessica can’t help but chuckled at the name given by the company. “Girls’ Generation? Like seriously?”. Jessica wasn’t the only one who thought the name is lame. Tiffany was making a protest statement by giving the ridiculous look on her face. But what done is done. They must follow what the company decides for them. “Unnie! Our group will be called Girls’ Generation!” Tiffany whined to her close unnie, Isak. Isak calm the girl, “Aww..it’s okay. You’ll get used to it.”. More than 5 members. That’s a lot. Jessica thought. Her group members are not strangers to her. She knew all of them very well. First was the face of the group and her favourite junior, Yoona. The girl who’s close to Yoona, Yuri. Then there is Sooyoung, the prankster. Then there’s one of her best friend, the dancing machine, Hyoyeon. Then there’s the really innocent but talented maknae, Seohyun. There’s also Tiffany. And last but not least Tiffany’s roommate, Taeyeon. Preparing for the group’s debut was tiring, but fun. Getting along with the others is not an easy task. There are sometimes small fights here and there in their group. But they tend to forget it quickly. They must try to get along for the sake of the group. 2007. 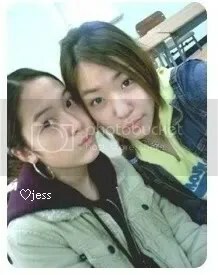 Jessica and Tiffany finally graduated from their high school. They were the same batch so they graduated together. They even went to the prom together with their other friends. Their group finally debut that year, after 2 years of training together. (With the sudden addition of another girl named Sunny.) Girls’ Generation. Jessica like their group name now. Tiffany shouted the name out loud. She’s proud of her group. She’s proud to be a part of Girls’ Generation. It’s winter time once again. Tiffany was alone when she first saw the white flakes coming from the sky. She smiled at the sweet memories of her two first snows in Korea. She was with her. Jessica. How she wished she’s with her right now. Suddenly she felt a human presence beside her, she turned around and was greeted by a surprised face. They both looked at each other for a few seconds before broke out laughing. They didn’t say anything, just laughing. When they finally came to their senses, Jessica took Tiffany’s hand and held it tight. She misses this feeling. She misses Tiffany. Tiffany smiles at Jessica’s sweet gesture. They went off running towards the town hand in hand. Polar opposites? They like being opposite. It’s not only they have different personality, their singing voices are also very different. 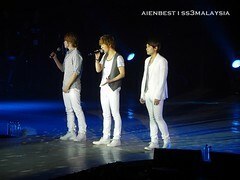 But when they sing together, their voices just blended well together. They surprised a lot of people at how compatible their voices are. They were even put to work together for a digital single with their maknae, Seohyun. People says that their voices are sweet like the chocolate milk called JeTi. JeTi is a famous drink for kids in Korea. So Jessica(Je) and Tiffany(Ti) are called JeTi, only sweeter. The girls finally got their much needed break after the end of their first album promotion. There were so many negativity surrounds them at the time. The girls went for hiatus for 9 months, even though there were a few members who worked individually like Taeyeon and Yoona. 9 months was a long period. During the hiatus, the 9 girls got the chance to know each other a little better and bonded even stronger. They overcome whatever jealousy they had with each other and became real sisters. Jessica and Tiffany also got even closer during the hiatus. Starting the end of 2008, the two of them became inseparable. They were always together, holding hands with the happy smiles on their faces. Actually, they’re just happy being with each other again, just like their days back in high school. 2009 is a blast for the girls. Their single, Gee became ridiculously successful that it won 1st place in the KBS Music Bank chart for 9 straight weeks. They had set a record that even they can’t break. Jessica and Tiffany are the ones who sang the intro. Their smooth English drives the fans crazy. Tiffany started to call Jessica with her English nickname in public. It’s used to be, Sica this, Sica that, but now she called her, Jessi unconsciously. It feels kind of special for Tiffany, because she’s the only one among the members who called Jessica, Jessi. She felt closer to her, in a way. 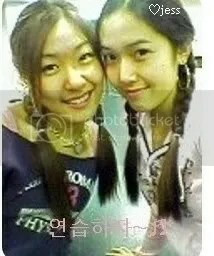 Jessica sometimes smiled at how alike she and Tiffany had become. She used to think that they are opposite at almost anything, like magnet poles of North and South (By the way, Tiffany is from South California and Jessica is from North California..Ironic much? I think its fate). But now she realized that they are so alike. They have similar heights. Tiffany is taller by 1 cm. Babies don’t like them. (All thanks to Kyungsan). They always hit on things when they laugh. (Sooyoung confirmed this in a concert interview). They have a weird way holding chopsticks. They don’t like guys with type A blood. 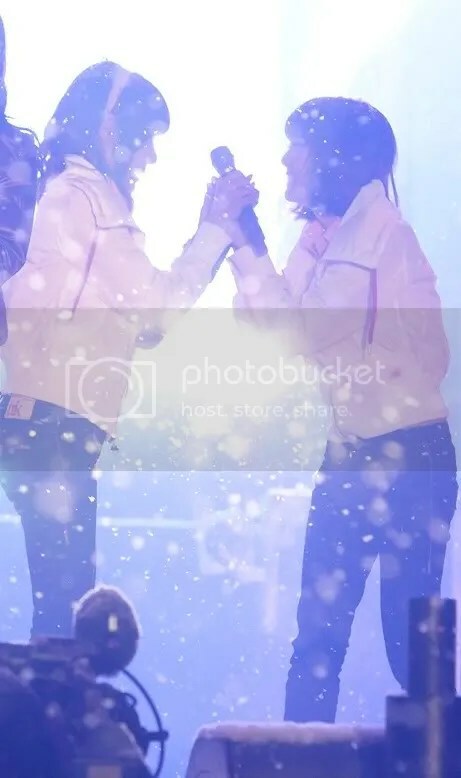 Sometimes it creeps Jessica out (in a good way) how Tiffany and she can finish each other’s sentences..
And some says they even look alike..
And always do things in sync with each other..
As time goes by, Girls’ Generation captures the hearts of the audience. Of course the road ahead will be bumpy along the way, but they know that they will manage to stay strong through it all. As long as they have each other’s shoulders to cry on, each other’s hugs for comfort, and each other’s hands to hold. A lot of people said that Jessica seems brighter these days. Some says it’s the hair that changed her personality. Jessica knew it better. It’s not the hair, she smiled as she held tight to Tiffany’s hand. Tiffany turned to her side and gave Jessica her eye-smile. It’s because I’m with her, and because all 9 of us are together. Jessica can’t be any happier.